iMessage is an instant message application designed, developed and maintained by Apple and is only available for iOS and MacOS users. It is application often categorized by users as an exclusive to the Apple ecosystem. Despite being exclusive to apple only ecosystem, the urge of the Windows users is not less. There is a high demand among Windows users to get iMessage for windows courtesy to its amazing features like person-to-person money transfer and superior encryption but not limited to the huge collection of emojis, GIF and, iMessage is the best when it comes to messaging. Getting iMessage for Windows can be a daunting task, but, we have made it simple through this article. We can still taste iMessage on Windows system by tweaking a bit, here and there. In this article, I’m going to show you 3 different ways to run iMessage on Windows PC. In this process, we can access a host Mac computer remotely from a Windows machine and get iMessage running (practically). Consider, if you have a Mac computer at your workplace and you just want to access iMessage installed on your Mac, then you can follow the steps mentioned below. 1) Make sure that you have Chrome Brower running on your Mac and your Windows, if not, download and install it on both computers. 2) Now, download Chrome Remote Desktop Host and install it on your Mac. 3) Open the app, it will provide with a code which you will need to enter in the chrome browser. This gives you access to your remote PC and you will be able to use iMessage on your device. know that, in most cases, you will not have access to a Mac and thus this method might not perfectly fulfil your need. But, this method will be suitable for those having a Mac computer in the workplace. Before you go on to read this, please note that the emulator used in this method is a paid one. We will be using iPadian, which is an iOS emulator. The biggest disadvantage of this method is that it is a paid emulator and it costs USD 20 to get the emulator working on a windows machine. Still, this could be a perfect method, if you love using application and want to do so without even switching to an iOS or MacOS. 1) Download the iPadian app by clicking the download button (and obviously paying after that). 2) Once you have got the installer, install it on your windows machine. The emulator comes with the latest iOS 12 app store. 3) Now, search for iMessage on the app store that comes with the iPadian.Using iPadian, you will not only be able to use iMessage on your windows machine but will also be able to use thousands of other Apple-only application that are there on the app store. VMWare workstation is software that enables you to run multiple operating systems in a windows/Linux machine as a virtual environment. VMWare is one of the leading software that does this work. One of the other alternatives includes the free and open source workstation, named VirtualBox. In this method, we will run MacOS on our windows machine and then install and use iMessage. 1) Download VMWare from their official website. After download, install the VMWare setup on your windows machine. 2) Once you are done with the first step, then, you’ve to download the Mac OS, which you will be installing in the VMWare for using iMessage. 3) Head over to this link and download the MacOS. After this, you will have VMWare installed on your PC, and Mac OS downloaded onto your system. 4) Install MacOS in your VMWare by following the steps mentioned in the video given below. 5) Once, you have completed all the steps mentioned above, then, you can easily download the iMessage software in your MacOS (installed in a virtual environment under VMWare). 6) To install iMessage, just go to the LaunchPad, and search for the App Store and then open it. 7) After this, search for iMessage and install it. With this method, you will not only be able to download and install MacOS and use iMessage on Windows 10, 8 and 7. So, this was all about iMessage for Windows. 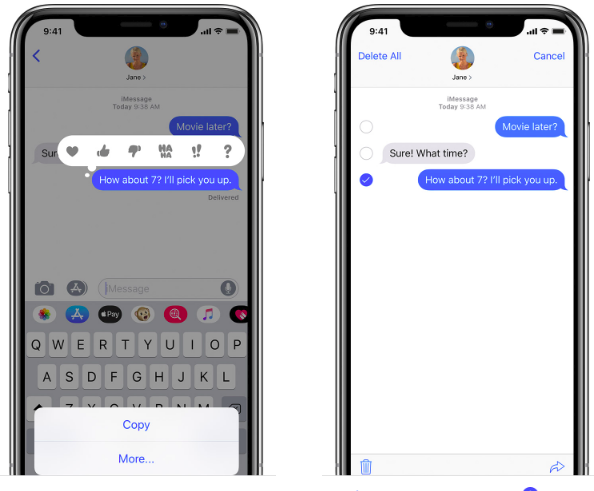 I shared three different methods to use iMessage on a windows 10, 8 and 7. I believe that, if you follow all the steps carefully, you will be able to install and use iMessage on your Windows machine.